She got a taste of the world of table tennis at an early age of eight. 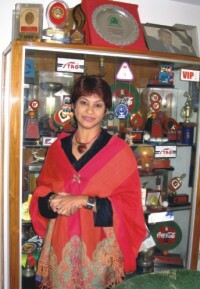 She is Zobera Rahman Linu -- the only female sports personality in Bangladesh to have her name listed in the Guiness Book of World Records. Linu was born in Kaptai on June 9. Her home district is in Khulna but she grew up in Sylhet at Shahzibazar. She passed SSC from Rosulpur school of Narsingdi. From Lalmatia Girls College, Dhaka, she completed her HSC as well as BA and she got her Master's degree in psychology from Jagannath University College. Linu describes how she got her introduction to table tennis. "When we were in Shahzibazar my father Sheikh Abdur Rahman used to go to Shahzibazar Officers Club everyday along with my older sister. They would play table tennis there. In 1973, at age eight, I went to that club for the first time and got introduced to the game. At the end of 1973 I began to practice table tennis on a regular basis and in 1974 my hobby turned into a full-fledged ambition." In 1974, Dhaka Press Club organised a Table Tennis Championship. Linu's father encouraged both her and her older sister to participate there. In this championship, Linu stood runner up and her sister became the champion. Though she was always in touch with other games like gollachute, dariabanda, badminton and handball for a particular time, her priority was table tennis. 1977 proved to be the most successful year for Linu as she stood champion in three categories -- single, doubles and mixed doubles. From 1979 to 2001, 24 years in a row excluding '81, '98 and '99, she won 16 national championships -- which is the best ever in any country of the world. In 1981 she did not participate. In 1998 and '99 there was no national championship. Meanwhile, in 1996 she decided to retire from table tennis as she was suffering from back pain. But she still had to play maintaining a deadline of 2002. Because she was informed by former table tennis player Helaluddin that she had a chance of creating a world record if she played a few more years. "I did not really think too much on breaking a world record," says Linu. " I was just playing. I am very thankful to Mr. Helal who helped me send all my documents and data to the authority of the Guinness Book of World Records. I was the only table tennis player in the world to win 16 consecutive national championships. That helped me to create history. They declared my name in 2002." Linu stood 5th in 1980's Asian Table Tennis Championship which took place in Japan. In the 1982 Pentagula championship she stood runner up in the mixed doubles. In the 1997 Independent Cup she stood champion in three categories. She gives maximum credit to her family members who were key figures behind her success. She is grateful to Helaluddin as well. While Linu is quite happy that she has made her country proud she is still a little disgruntled by the way she has been treated by Bangladesh Biman, her official sponsor, for which she played 18 years, winning 14 championships. "Biman has given me nothing. No job, no salary, only pocket money. The government did the same. Today cricket is getting maximum priority. They are getting big sponsors, jobs, all kinds of opportunities. If one- third of this money and opportunities are given for table tennis, players will be able to give their best. The government should back them up providing sufficient opportunity like proper physical training, good food, money, jobs, etc." She added, "I know of such table tennis players who have Masters degrees but no job. If the government gives them financial assurance they will be able to push themselves professionally." “In our time the playing environment was very good. There was a feeling of comraderie among the boys and girls. We had both opportunities and the interest to practice and we were very helpful towards each other." She added further, "If a girl practices with a boy then she can do better and her performance gets more polished. Boys of my time were very helpful. Nowadays, this environment has changed. Today's players wear modern dresses but do not have a modern mentality. Today a male player does not want to practice with a female player." Linu believes that if Biman and Ansar sponsor table tennis players, they will do better. Once again the government has to help train the players. Linu says, "Five minutes of warm up is not enough. One must have proper physical fitness. Because only a physically fit player can be a good player. Players must be serious, sincere and dedicated to their profession. To some extent players themselves are responsible for their failure." After the registration of her name in the Guinness Book, Linu has been awarded a gold medal by Sheikh Russel Krirachakra and Mariners Club has given her lifetime membership. 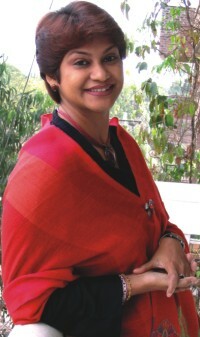 Writer of four books including Amar Bashanta Deen, Linu is now writing her autobiography and working as the General Secretary of Abahani. Table tennis has not given her money but a lot of prestige and honour -- with which she is happy. Always a bit of a tomboy, Linu has devoted herself to sports and still has not found Mr. Right. But then Linu's first love has always been undeniably table tennis.